A talking pen, which says the letter sounds, the words, and sentences on a page. It also gives the names of many objects touched! The text, in the reading books, is given twice, the second time in a phonically regular form, to help children when they get stuck. An easy-to-use sequence which does not depend on expert knowledge by a parent or teacher. Instead the child is motivated through the talking pen, and empowered by this pen, and by the extra text. The talking pen motivates children as well as guiding their learning. It models each letter sound for them, and it models blending for reading (so sh-ee-p makes sheep). Some of the relationships between letters and sounds are different in English from other languages, and this helps children get them right, and from early on. 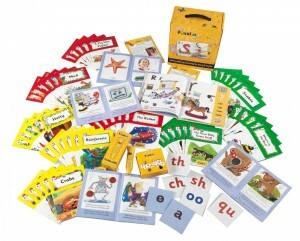 The methodology of ‘synthetic phonics’ in Jolly Phonics is recognised as being essential for children learning to read. Rather than just being taught the alphabet, and to memorise words, children learn all the letter sounds of English, and how to use them to read new words. Vocabulary is also developed, as the talking pen names many objects in pictures when they are touched. The talking pen responds to all the books and flash cards. After a year or so of early teaching of reading, some children may still be struggling. These children can be similar in age to one another. Often they are given extra help in small groups by a teaching assistant. Jolly Phonics Extra is ideal with such groups, say with up to four pupils. The programme models each letter sound, and the blending, so the teaching takes place even if there is a less experienced teaching assistant. When children have had some years of struggling to learn to read they can become demotivated. They may also feel that the material given to them is ‘childish’. Jolly Buddies is a highly effective solution to these issues. It pairs an older child with a younger one, both of whom are behind. The older one is asked to help the younger one, and given control over the material. The talking pen amazes the children. They want to use it, and see what it responds to. To any question of childishness, the older child is told that the material is not for them, but for the younger child – which makes it all right. The older child also has the respect of the younger child, which again motivates them to being engaged and learning. It is recommended that the use of Jolly Buddies is intensive, and time limited, so the children make swift progress. Sessions should be every school day for a term (12 weeks), after which a new group of children should start. 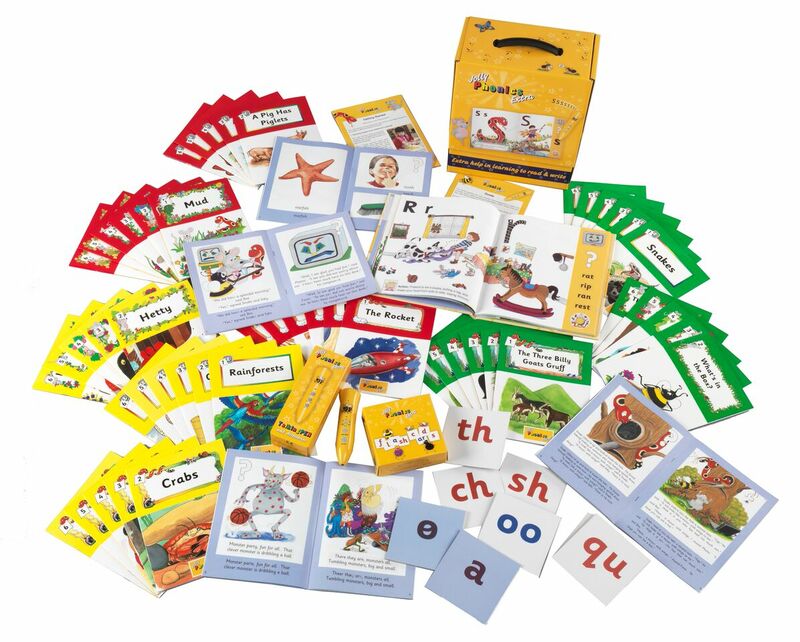 This time limit encourages the children to use the flash cards and books at a pace. The results from Jolly Buddies research studies have been most impressive, with children gaining an average of over 2 years in reading ability.